An amazing documentary called "The Unforeseen" about the unintended consequences of development: Check on the Sundance Channel for the next showing. 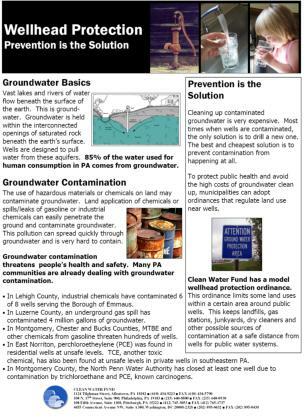 Clean Water Fund has produced this very informative flyer outlining groundwater basics and the impact contamination of that groundwater would have on our health and safety. Download a copy of this flyer so you too can understand what is at stake. Many communities in Pennsylvania are already dealing with groundwater contamination. Is the Upper East Branch of the Brandywine next? Did you know that approximately 199,500 people rely on water from public water systems fed by the Brandywine Creek.